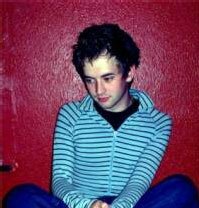 Today we look at young Nathan Fake (Actually his birthname... Mental note: Get cool surname!). Nathan is twenty two years old and from England and is one of the many "man of the minute" guys. He made a name for himself way back in 2004 with the single Outhouse released on James Holdens Border Community Label and has since done various remixes and a couple of other records. The two tracks on offer today are taken from Fake's recent album Drowning In A Sea Of Love. The album takes a step away from the usually techy sounds of Border Community into more ambient waters. First track of the day is a great soundtrack for a sunny picnic. Pounding kick-drums nowhere to be found - instead washes of lazy, lush synthizisers and easy beats create a romatic summery feel. It seems like Nathan Fake has a love for huge synths. The next one is all about the absolutely massive layers of sound that jump out of the speakers half a minute into the song. A bit reminicent of M83 or even early nineties shoegazers like My Bloody Valentine. Only not as grumpy.